Underwriting is the most important aspect of the life insurance procurement process – and the least understood by consumers. The insurance industry promotes the perception that underwriting is a fact-based assessment of risk. However, closer examination reveals that life underwriting is more an art, than a science. The first category includes just the facts, while the second category could include inaccuracies that the underwriter thinks are facts. (The line between these categories is usually invisible.) The last category may include information that the underwriter would like to see, but can’t. For instance, the underwriter might want to see the pathology report on the lesion that was removed from your back 10 years ago, but can’t because the report is not in your physician’s file and the dermatologist you were referred to has long since retired. Before rendering a decision, underwriters need to gather evidence and information on the health, finances and lifestyle of an applicant. This information comes in the form of test results, medical files, reports from physicians and specialists, tax returns, motor vehicle reports, etc. Here’s where the problems start. Medical records can be tricky to assess for a number of reasons. It is not uncommon for one’s medical records to include incomplete, inaccurate or entirely incorrect information or diagnoses. And medical records can be difficult to interpret and understand. 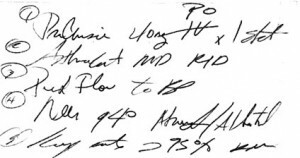 If you’ve ever had a prescription, you know what a doctor’s handwriting looks like – not pretty. How is an underwriter supposed to make any sense of this? 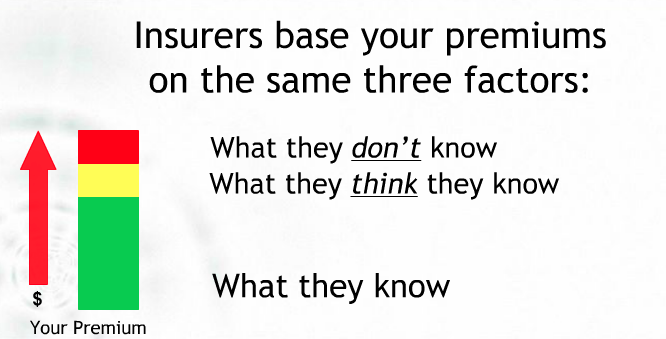 Underwriters are not medical professionals making decisions about your health. They are business people making risk decisions for an insurer that is entering into a policy contract to provide a benefit to you. As in any business, underwriters have internal business objectives against which they are monitored through regular audits. No underwriter wants their audit to show that they have accepted bad risks and charged too little premium. So, when confronted with any uncertainty about a risk, the underwriter looks better if they add ratings to pad premiums. In Canada, most underwriters are under enormous pressure to process more files, faster and faster. As a result, they cannot afford the time to contact a physician to clarify medical facts or dates (not to mention, their illegible handwritten notes). Nor do they typically contact an applicant to clarify a situation. It just doesn’t happen. Whether or not they are able to obtain the information they need, underwriters still need to render timely decisions on insurance applications. Thus, many underwriting decisions are as much a result of what the underwriter thinks they know and don’t know, as it is about what they, in fact, do know. IPS has a developed an effective alternative to traditional insurance application process – one that strives to clarify the facts, while eliminating any inaccuracies and uncertainties surrounding an applicant’s risk. We achieve this by collecting all the evidence required to render an underwriting decision, so that we can ensure the information is accurate. Any gaps can be clarified with you and your physicians before any evidence is submitted to the insurers. And contextual information can be added to help insurance company underwriters understand the big picture – why are you seeking insurance coverage, what are you doing to promote your health and well-being, why you have so many traffic violations, etc. Then, we submit your case to multiple insurance carriers in a structured, competitive bidding process. This forces the underwriters to be accountable to you. No longer can they afford to pad your premiums because of their uncertainty. If they do, they risk losing your business to one of their competitors. Using this exclusive methodology – we call it Advocacy Underwriting – IPS ensures that your insurance premiums are fair and based only on the facts. This entry was posted in Underwriting. Bookmark the permalink.